I collect iPhone tips. Most of the time I like to share the ones I think will be the most helpful or interesting to iPhone users, today I thought I’d break my tradition with this extensive list of funny things to ask Siri if you want a tolerably amusing response. Since inception, the teams behind Siri have worked to make sure the useful voice assistant also has a little character. I think they understand that in order to convince humans to trust the voice inside the machine it is important to make that voice approachable. That’s why you can use different voices and set different regions when you set Siri up – my HomePod is a female Australian, but my iPhone’s Siri is a UK woman, for example. The idea is that by making Siri approachable as well as relatively efficient, users get to build trust in the system over time. Apple’s regularly repeated commitments to privacy also help build this trust. Why is Siri funny? It just wants to get along. A: There’s lots of answers you might get, including: “Siri, that’s me”, “I am Siri”, “Yours truly”. Q: What does Siri mean? 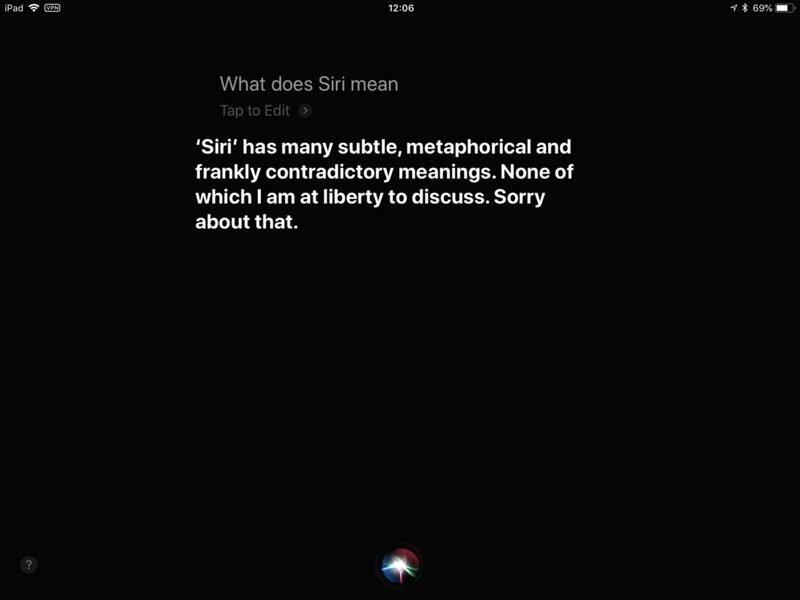 More about Siri? You’ll find more about Siri at this link. Why did Apple make you, Siri? What’s best Windows or Mac? Blue pill or the red one? Siri tells rubbish jokes. Ask it “Tell me a joke,” or “make me laugh” enough times and you’ll agree with my surmise. Say “Knock-knock” to launch a knock-knock joke session with terrible punchlines. Or ask it why the chicken crossed the road. You’ll probably want to give up about then. If you don’t, try asking: “How much wood could a woodchuck chuck of woodchuck could chuck wood?” You can even ask: “How many Apple Store geniuses does it take to screw in a lightbulb?” Don’t say I didn’t warn you. This is not after dinner speech territory. Just don’t ask if Siri knows any good riddles (#101). Have you come across other funny or amusing Siri responses? Let us all know in comments below. Siri needs to be funnier! She can be so boring, lol! I think apple needs to code some more answers for those boring days when you’ve got nothing to do. Ask Siri what zero divided by zero is?